These pages are completely unofficial. The author is not affiliated with any transportation agency. The contents of this website are presented for informational purposes only, are derived from publicly-available sources, and the accuracy of the contents is not guaranteed. In addition, some information presented, usually obvious from its context, is solely the opinion of the author. All original content is © Copyright 2000–06 Chris Lawrence. See the full copyright and license notice for details. This site looks best in a browser that understands Cascading Style Sheets (it has been tested in recent versions of Mozilla, Internet Explorer, Opera, and Konqueror), but it has also been designed to be accessible by text-only and text-to-speech browsers. [Oct 3] In Indiana, environmental groups and local officials filed suit Monday seeking an injunction to block continued work on the Interstate 69 extension through southwest Indiana, alleging that the environmental study was rigged to support the “direct” routing via Bloomington between Evansville and Indianapolis. Meanwhile, in Mississippi, 12 miles of Interstate 69 will open to traffic at 2 p.m. today connecting Tunica County with Interstate 55 in the northwestern portion of the state. The Commercial Appeal also reports that construction work on Mississippi's portion of the Memphis Outer Beltway (I-269) is expected to begin in the next three years. Photos of the new route are available here, taken by G. Clark. [Jul 12] The Memphis Commercial Appeal reports that the Mississippi Department of Transportation plans to open Mississippi 304 and I-69 between U.S. 61 and I-55 on October 3, with the spur between the route and current MS 304 opening around two months later; a similar story appears on the AP newswire. [Jun 21] Indiana: On Tuesday, the Indiana Supreme Court effectively ended a lawsuit brought by opponents of leasing the Indiana East-West Toll Road and constructing most of I-69 in Indiana as a new toll road. Mississippi: MDOT has designated a preferred alternative for I-69 between Benoit and Robinsonville; see their website for a map. Arkansas/Mississippi: The Greenville (Miss.) Delta Democrat Times reports that a Greenville chamber of commerce member believes Arkansas officials are dragging their feet on constructing their portions of I-69 in the apparent hope of diverting the route to bypass Mississippi. Arkansas: The Pine Bluff Commercial reports that FHWA has approved the I-69 route in southern Arkansas between El Dorado and McGehee; in addition, a four-mile section of future Interstate 530 (SIU 28) has been opened to traffic near Wilmar. Texas: The Neuces County (Tex.) Record Star looks at the companies competing to develop Interstate 69 in Texas as part of the Trans-Texas Corridor concept. Tennessee: TDOT has selected a preferred alternative for most of Interstate 69 in West Tennessee between Millington and Dyersburg; the preferred route largely runs to the west of existing U.S. 51, and will truncate Interstate 155 west of Dyersburg. TDOT's proposed 2007-09 highway plan includes numerous Interstate 69-related projects, including preliminary engineering on SIU 8, three construction projects on Tennessee's portion of Interstate 269 (SIU 9), and right-of-way acquisition for three portions of I-69 in Obion County (SIU 7). [Feb 3] The Louisiana Department of Transportation and Development has announced the preferred alignment for I-69 between Haughton, La. and El Dorado, Ark. (SIU 14). The Shreveport Times also carries a report. The Indiana House of Representatives has approved an amendment to the governor's Major Moves transportation plan that encourages (but does not require) the governor to reroute I-69 between Evansville and Indianapolis to avoid the SR 37 corridor southwest Marion County. The overall proposal was approved by the House on Wednesday and is expected to be passed by the Senate in the next month. [Jan 18] The Associated Press reports that the Board of Supervisors of DeSoto County (Miss.) has signed an agreement with MDOT to issue bonds to accelerate construction of 16 miles of the I-269 Memphis Outer Beltway from I-55 in Hernando to U.S. 78 (Future I-22) in Byhalia (SIU 9). A similar bond agreement has been used for I-69 mainline work in the western half of the county. The Martinsville (Ind.) Reporter-Times has been publishing a series on the impact of upgrading Indiana SR 37 to interstate standards in Morgan County; parts one and two of the series are now online. The Greenville (Miss.) Delta Democrat Times reports on a special public hearing scheduled for Thursday on the proposed “I-169 connector” between Greenville and proposed I-69 near the eastern terminus of the Great River Bridge at Benoit (SIU 12). A description of an earlier version of the proposed route can be found at Adam Froehlig's website. [Oct 14] Evansville mayor Jonathan Weinzapfel has thrown his support behind Indiana Gov. Mitch Daniels' proposal to finance construction of I-69 between Evansville and Indianapolis (SIU 3) with tolls. Meanwhile, the idea of charging tolls on the part of I-69 which will overlay existing Indiana 37 has met with a frosty reception further north; it is unclear whether current federal law would even permit charging tolls on an upgraded Indiana 37. In related news, materials from the October 11 public meeting in Martinsville are available online. [Sep 19] The AP reports that the Mississippi Transportation Commission has approved the route for I-69 SIU 11 (Benoit–Robinsonville, Miss. ), preferring the “central” alternative route. No maps of the preferred alternative are available online at present. [Aug 1] Congress has passed the six-year reauthorization of the nation's surface transportation programs (TEA-LU); the details of the legislation can be found at the U.S. House Rules Committee website. However, the authorized expenditures must be funded in subsequent appropriations bills for states to spend the money on the earmarked projects (including several projects on the I-69 corridor). $2.5 million for design and ROW acquisiton, I-69 SIU 15. These authorizations are in addition to funds available to the states for use on I-69 and related projects as part of their Minimum Guarantee funding, so the states may ultimately spend a great deal more federal money on the route over the next four years (when the bill expires). [Jul 19] A contractor's office south of Bloomington, Indiana, was vandalized Monday morning in the latest of a string of attacks in recent years connected to the Interstate 69 extension in southwest Indiana. The incident included a failed attempt at arson using multiple improvised Molotov cocktails. [Feb 26] The DeSoto County edition of the Commercial Appeal reports that MDOT staff members are recommending that the state transportation commission accept a $53.8 million low bid for paving and other work on Interstate 69 in DeSoto and Tunica counties (SIU 10), despite coming in about 16% above the initial $45 million bond issue by Tunica County. Northern District Transportation Commissioner Bill Minor plans to vote in favor of the proposal at the commission's March 8 meeting; if the proposal is approved, construction would likely start in April and be done by late 2006. CA also indicates that the Marshall County Industrial Development Authority is proposing a similar bond issue to finance construction of a section of the Memphis Outer Loop, proposed Interstate 269, between U.S. 78 near Byhalia and Tennessee 385 in Collierville (SIU 9). However, such funding will have to wait until the environmental studies for that section are approved later this year. [Feb 20] The DeSoto Times Today reports that MDOT officials will open bids on the paving contract for I-69 between U.S. 61 and Interstate 55 in DeSoto County (SIU 10) on Tuesday, February 22nd. $45 million in bonds have been issued by Tunica County to pay for the completion of this section of highway; the bonds will be repaid by state and federal gasoline tax funds. [Feb 9] The Indianapolis Star reports that on Monday, the Indianapolis City-County Council adopted a non-binding resolution opposing plans to upgrade Indiana 37 in southwest Indianapolis as part of the Interstate 69 project. Highway opponents, and supporters of the Terre Haute alternative (including the Star ’s editorial board), think the resolution may work in their favor under new governor Mitch Daniels; on the other hand, the Evansville Courier & Press editors suggest that the Indianapolis-area squabble may play into Daniels' hands by lending additional support for his proposal to relocate the stretch of highway north of Martinsville to connect to I-70 near the Indianapolis airport, without affecting highway plans south of Martinsville. The Courier & Press also reported that Daniels may want to finance I-69 construction in the state through tolls. The Henderson Gleaner reported on January 20th that Owensboro officials want a I-69 spur designation for the Audubon Parkway between Owensboro and Henderson. Upgrading the parkway would lead to similar issues as Kentucky's plans to upgrade three parkways as part of the I-69 mainline through the state, expected to cost between $2 and $11 million per mile. The Associated Press reports that the planning commission of Dyer County (Tenn.) favors using Dyersburg's US 412 eastern bypass as part of Interstate 69 between Dyersburg and Millington (SIU 8). The Shreveport Times reported January 16th that a final route for I-69 around Shreveport and Bossier City would be announced in the next two weeks; no such announcement has arrived yet (SIU 15). TxDOT has posted a frequently asked questions page and a project fact sheet and timeline to the I-69/Trans Texas Corridor Study website. Public hearings are also scheduled for the TTC-35 corridor component, which may overlap portions of I-69 in south Texas. Chris will be presenting an overview of the Interstate 69 project's history and current status at an upcoming symposium on the effects of NAFTA hosted by the Center for Research on Women and the Benjamin L. Hooks Institute for Social Change at the University of Memphis on March 26th. [Dec 1] The Memphis Commercial Appeal reports that the Mississippi and Tennessee departments of transportation have decided on the alignments for I-69 and I-269 in the Memphis area (SIU 9); I-69 will follow the western A-1 alternative between Frayser and Millington, while I-269 will follow the middle B-1 alternative across southern DeSoto County and western Marshall County to Collierville. TDOT's press release includes essentially the same information. The next stage of the project will be the preparation of a final environmental impact statement (FEIS) for approval by the Federal Highway Administration. [Jun 28] The Greenville, Miss., Delta Democrat Times carries an editorial on the long-running feud between Bolivar and Washington counties over the routing of I-69 in the Mississippi Delta. [Jun 26] The Southwest Perry Civic Association plans to protest the I-69 proposal at a series of meetings on the Indianapolis comprehensive plan, according to the Indianapolis Star . [Jun 24] The Pine Bluff Commercial reports on the signing of the final federal Record of Decision on the Great River Bridge project, SIU 12 of the national I-69 corridor. The DeSoto Times Today carries reaction by state transportation commissioner Bill Minor to DeSoto County's plan to build a school in the path of proposed I-269 in southeast DeSoto County. [Jun 21] The Memphis Commercial Appeal has an article on the environmental impact of the systems approach alternative to I-69 in the Memphis area (SIU 9). [Jun 14] The Evansville Courier & Press reports on the opening of regional study offices along I-69 SIU 3 in southwest Indiana. TDOT has posted all of the Draft Environmental Impact Statement for SIU 9 (Memphis) to its website, along with a copy of their latest project newsletter. Comments on the DEIS will be accepted through August 12. I have reorganized the information on Interstate 69 in Texas to appear on a single page, to reflect the unified approach TxDOT is taking with its study of the route, which may result in changes to the existing Texas SIU boundaries. [Jun 10] The DeSoto Times reports that the proposed location of the DeSoto South school campus in DeSoto County, Miss., is directly in the path of the proposed I-269 outer loop. A similar report appears in the Memphis Commercial Appeal . The DeSoto Times also previews the upcoming public meetings on Interstate 69 and Interstate 269 in the Memphis area. [Apr 19] The Associated Press reports that the Arkansas Highway and Transportation Department has opened bids for the first portion of the Southeast Arkansas I-69 Connector (I-530 Extension), SIU 28 of the national corridor. This project will build an 4.5 mile, 2-lane facility between Ark. 35 and U.S. 278 west of Monticello, at a cost of $11 million. Work at the Pine Bluff end of the project (connecting to existing I-530) is expected to be let in the near future. The AP also reports that a new group, “Hoosier Voices for I-69”, is being formed by business and organized labor to push for the I-69 project to be completed in Indiana. The Corpus Christi Caller-Times looks ahead to this week's meetings on the I-69 element of the Trans Texas Corridor in George West and Kingsville. [Apr 13] The Hoosier Environmental Council claims the I-69 route selection process in Indiana was “rigged,” due to $150,000 in grants that were given to the I-69 Mid-Continent Highway Coalition by state and local government in Indiana; the non-profit group (not to be confused with the I-69 National Steering Committee), which includes local officials from the communities along the I-69 corridor in several states, supported the direct (3C) route for I-69 in Indiana. [Apr 8] Them's fightin' words: Bloomington city council member Andy Ruff calls INDOT Commissioner J. Bryan Nicol a “young punk bureaucrat political wannabe” in this Indiana Daily Student article on the I-69 extension in Indiana. The Tyler (Tex.) Morning Telegraph reports on low turnout at a public meeting on TxDOT's Trans Texas Corridor plan and interviews the proprietors of CorridorWatch.org. [Apr 4] Two Indianapolis Star editorial writers face off on I-69: op-ed page editor Tim Swarens thinks a U.S. 41 route would have been preferable, while writer James Patterson supports the "direct" route. 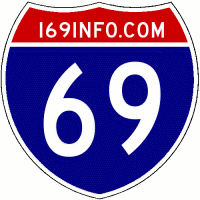 The Fort Wayne Journal Gazette approves of the direct I-69 route in an editorial. [Apr 1] No foolin': the final environmental impact statement for the Great River Bridge portion of I-69, SIU 12, has been released, and is available at NationalI69.org. Public comments will be accepted through May 3, 2004. The Jackson (Miss.) Clarion-Ledger indicates that the EIS for SIU 11 between Benoit and Robinsonville, Miss. will be complete sometime this year. [Mar 28] The Evansville Courier & Press profiles INDOT Commissioner J. Bryan Nicol, who is at the center of the state's I-69 routing controversy. Construction of I-69 and I-269 is part of the long-range transportation plan approved by the Memphis Metropolitan Planning Organization, according to the DeSoto Times . The paper also reports that April's meeting of the DeSoto Citizens for Growth will feature a presentation on I-69 from Jim McDougal, assistant planner and director of transportation for DeSoto County. The meeting is open to the public, and is scheduled for Monday, April 1, at 6:45 p.m. at the Hernando Public Library. Texas transportation commissioner Esperanza "Hope" Andrade says Texas doesn't have enough money to build Interstate 69 between the Rio Grande Valley and I-37 without using tolls, according to the Valley Morning Star . [Mar 11] The DeSoto Times wonders if the proposed FedEx Ground hub in Olive Branch, Miss., will help get I-269 off the ground. [Mar 6] FHWA's March 2004 “Successes in Streamlining” newsletter features a discussion of TxDOT's I-69/Trans-Texas Corridor planning process manual. [Feb 28] I-69 opponents in Indiana claim the state has ignored the presence of karst features in its study of the route, according to the Indianapolis Star . Millington (Tenn.) residents are concerned that the construction of Interstate 69 in the area may lead to flooding, according to the Memphis Flyer . The Gleaner (Henderson, Ky.) reports that an area subdivision is planned to be built in the middle of the preferred corridor for I-69 east of the city. DeSoto County (Miss.) planners are considering future zoning along the I-69/I-269 corridor in the county, according to the DeSoto Times . [Feb 26] The Memphis Regional Chamber has formed the Regional Logistics Council to plan to improve the area's infrastructure to attract development, according to this week's Memphis Business Journal . [Feb 17] The Indiana Hardwood Lumbermen's Association and environmental groups have joined forces in opposition to the “new terrain” route for I-69 in Indiana, according to the AP. Republican Randy Harris has dropped out of the Indiana gubernatorial sweepstakes, leaving three men vying for the Republican nod to face incumbent Democrat Joe Kernan. Harris is a supporter of the direct I-69 route. Daniels says he supports a direct Interstate 69 route to Indianapolis, and wants to see the work begin. "I can't stand the thought of taking 14 years to do it. I want to speed it up. It's going to eat up most of the money for the rest of the roads...we should build it and build it faster." Daniels said he supports starting the Indiana work from the southern end, but would like to find ways to save some money or tap other revenue sources. "We're going to be at this for years," he said. "If there's a slightly better way to do it, I'd like to explore it. It might be politically smart to just say 'aye-aye', but I just want to build the thing, not promise it. The plan as it sits there has some risks." According to the article, Daniels also favors moving all of Indiana into the Central time zone. In other gubernatorial news, fellow Republican candidate Eric Miller thinks the proposed route is too costly, according to the Indianapolis Star . The Evansville Courier and Press interviews a number of the homeowners whose property will be taken by the preferred I-69 alternative between Evansville and Henderson. The same paper carries an editorial calling the decision to support an east-side route sound, and which argues that community leaders can now devote their full attention to keeping the Evansville-to-Indianapolis portion of the project on-track. [Feb 11] The Evansville Courier & Press is among those reporting that Indiana and Kentucky have agreed on an eastern route for I-69 around Evansville and Henderson as the preferred alternative (SIU 4), as most observers had expected. Public hearings on the preferred alternative are planned for mid-March. The full draft environmental impact statement is available at the project website. The Courier & Press also reports that plans for an industrial park just north of the proposed I-64/I-69 interchange northeast of Evansville in Warrick County are afoot. Mississippi Department of Transportation District 2 engineer Jimmy Dickerson spoke to the Olive Branch (Miss.) Rotary Club Tuesday about highway construction in northwest Mississippi, including the I-69 project. Dickerson said that contracts for paving I-69 from U.S. 61 to I-55 were currently being prepared by MDOT; upcoming plans include the construction of the first phase of the I-55 widening project from the I-69 interchange to the Tennessee state line, improvements to U.S. 78 so it can be designated as part of future Interstate 22, and the planning and eventual construction of the proposed I-269 Memphis outer beltway. [Feb 7] The latest salvo in the Indiana I-69 fight is an attack on the state's economic study, according to the Associated Press. The Longview News-Journal reports that U.S. Sen. John Cornyn considers the I-69 corridor a priority for funding in Texas. The AP also reports that how the I-69 project in Indiana will be funded remains in question, as the six-year transportation reauthorization bill is held up in Washington due to divisions in Congress and with President Bush over potentially raising the federal gasoline tax; Indiana's state funding for such a large undertaking is also limited. Arkansas transportation planners are considering how to fund highway construction in that state over the next decade, and are facing an anticipated $11.8 billion shortfall over that period, according to the Paragould Daily Press . The Tennessee Department of Transportation will hold an informal public meeting on the widening of existing I-240 (future I-69) in Memphis between the I-40 Midtown interchange and the I-240/55 interchange on Thursday, 4 March 2004, starting at 5:00 p.m. at Mississippi Blvd. Christian Church, 70 North Bellevue Blvd. For more details, see the public meeting notice. [Jan 23] I've updated the FY2004 funding table for I-69-related projects to reflect the final version of the Omnibus Appropriations Bill, which was approved by the Senate on Thursday, January 22nd, and passed into law on Friday, January 23rd. [Jan 21] I-69 opponents turned out in force for a forum with state legislatures organized by the Indianapolis Star , according to a report in that newspaper. [Jan 17] A preferred corridor has been announced for I-69 SIU 14 (Shreveport, La.–El Dorado, Ark. ); the next step will be developing alignment alternatives within the preferred corridor. Extensive coverage of the decision appears in the Shreveport Times . The article also indicates an alignment has been selected for SIU 15, but an announcement is likely to be delayed due to the Louisiana gubernatorial transition. The Evansville Courier & Press editorial page opposes extending the February 2nd comments deadline for the SIU 3 FEIS. [Jan 15] The Evansville Courier & Press reports that the Hoosier Environmental Council has been raising funds for a federal lawsuit against the I-69 environmental study in Indiana since November; the group is currently short of its goal of raising $100,000 to fight the anticipated decision by the Federal Highway Administration to approve the state's final environmental impact statement on the project for SIU 3. The same group is also asking for the 47-day public comment period on the FEIS to be extended. Also on SIU 3: the FEIS includes plans for four rest areas and noise barriers along the I-69 route. The FY2004 omnibus appropriations bill, which has yet to be approved by Congress—despite the fact FY2004 started October 1, 2003—includes nearly $6 million in earmarked funding for paving I-69 SIU 10 between Robinsonville and Hernando, Miss. Also on SIU 10: the DeSoto Times Today looks at planning efforts to avoid “sprawl” along the route in the Hernando area. The Jacksonville (Tex.) Daily Progress reports on confusion resulting from both U.S. 69 and I-69 projects being planned in that state. I-69 will closely follow U.S. 59 in Texas, and the two routes (proposed I-69 and U.S. 69) intersect in Lufkin. Although Texas does permit duplication in route numbers, it is against federal guidelines for an Interstate and U.S. highway to share the same number in a state. The Alliance for I-69 Texas has appointed Corpus Christi's Mark Scott to its board of directors, and Harris County Judge Robert Eckels as its chairman, according to the Corpus Christi Caller-Times . The Williamson County Review Appeal has an interview with TDOT Commissioner Gerald Nicely that briefly mentions I-69 as one of the few “big” projects TDOT is likely to undertake in the future.